Qanbar-Polo is a food from Shiraz, a large city with an ancient civilization, located in the southwest of Iran in Fars province. This food tastes sweet-sour and is very delicious. It is a nutritious traditional food of Shiraz usually cooked for parties and formal ceremonies. First, put the minced meat in a bowl. Add salt, pepper, gram flour and turmeric, and mix them well. Make meat balls as small as a walnut out of the mixed ingredients, fry them and put them away. Then shred the onion and fry it in a pan until the shreds turn gold. Afterwards, add crushed walnut and sauté them. Then add pomegranate paste. Add a little salt and walnut until the pomegranate paste becomes thick. Meanwhile, add the sultanas, which have already been rinsed and washed, so that the sultanas will be sautéd as well. Take care the sultanas are not burned. Mix the ingredients as soon as you add the sultanas. Put the ingredients in the middle of the rice and allow the dish to be cooked through. You may mix the ingredients and rice when serving the dish. 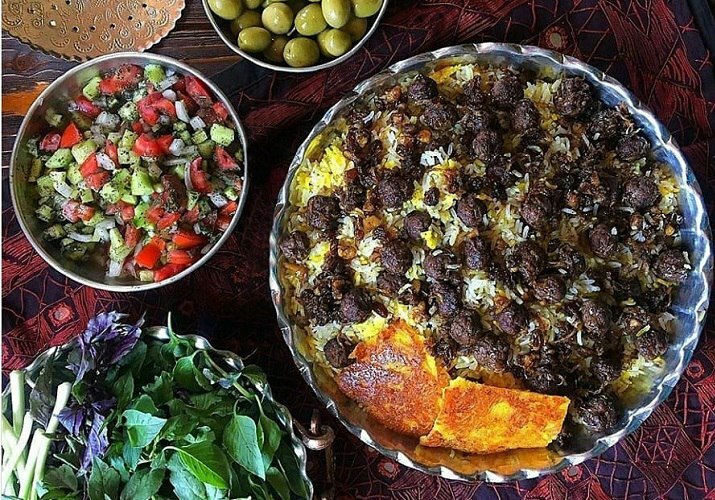 In Shiraz, this food is served with Shirazi salad and has a very pleasant aroma.